Alfred Lord Tennyson strikes an imposing figure. Ensconced in a loosely fitting morning coat, with a fluid raven mane, a pineal beard, an aquiline face and a nose that could plough icebergs, he had all the bearings of a Victorian bard. He also had all the credentials. Tennyson began writing poetry as a child. Aged 12 he penned a 6,000 line epic in the style of Sir Walter Scott, a few years later a precocious verse-drama, The Devil and the Lady. It fact, the writing never ceased even when he failed to publish anything for over a decade. Born on 6th August 1809 in Somersby, Lincolnshire, Tennyson was the sixth of 12 siblings. His home-life was characterised by strife, family feuds, poverty and an iconoclastic, chronically-drunk and eventually-mad father. In 1827, Tennyson left for Trinity College, Cambridge, and a year later together with his brother Charles published a collection of juvenilia called Poems by Two Brothers. A couple years on another collection, Chiefly Lyrical, followed. Tennyson’s early forays into poetry attracted the attention of an undergraduate literary group, The Apostles, headed by Arthur Henry Hallam. The two formed a filial bond and later journeyed across Europe together in 1830 and again in 1832. Hallam’s sudden death in 1833 from a cerebral haemorrhage affected Tennyson so profoundly that “for the next 10 years he published no book, had no regular occupation, drank port, smoked strong tobacco and was poor and unhappy.” After this interlude, Tennyson began writing In Memoriam, his most distinguished work commemorating his friend. It took him nearly 20 years, earned him many accolades and made him a potentate of Victorian verse. Writing about Tennyson, in a critique entitled Essays Ancient and Modern T.S. Eliot said that Tennyson had “three qualities which are seldom found together except in the greatest poets: abundance, variety and complete competence”. Samuel Coleridge Taylor praised Tennyson’s work for its “great deal of beauty”. While Thomas Carlyle speaking of him in a letter to Waldo Ralph Emerson said: “Alfred is one of the few British or Foreign Figures who are and remain beautiful to me; a true human soul, or some authentic approximation thereto, to whom your own soul can say, Brother! One of the finest looking men in the world. His voice is musical metallic – fit for loud laugher and piercing wail, and all that may lie between; speech and speculation, free and plenteous.” Others, however, have been less kind. W. H. Auden said that Tennyson “had the finest ear, perhaps, of any English poet” but “was also undoubtedly the stupidest,” while George Bernard Shaw quipped that Tennyson had the “brains of a third-rate policeman.” As with any writer Tennyson’s merits are debatable, but for me he has always been someone whom I admired. In 1850, at the age of 41, Tennyson succeeded William Wordsworth as the Poet Laureate. He held the tenure for over 50 years until his death – longer than any other Laureate before or after. Tennyson was a commanding figure with a calliopean voice which demanded attention when he spoke and captivated everyone when he did. Highly popular in his own lifetime, Tennyson was often referred to as “the Poet of the People,” celebrated for reflecting the mind of an entire nation. This has more recently counted against him but In Memoriam remains one of the most memorable elegies in the English language. So much so that one of the lines (“Tis better to have loved and lost/Than never to have loved at all”) from the poem has become indelibly engrained in our collective consciousness and vernacular. Writing about In Memoriam Tennyson himself said: “It is rather the cry of the whole human race than mine. In the poem altogether private grief swells out into thought of, and hope for, the whole world. 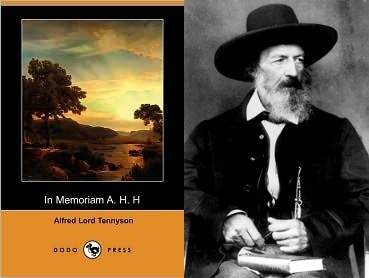 It begins with a funeral and ends with a marriage—begins with death and ends in promise of a new life—a sort of Divine Comedy, cheerful at the close.” Remarkably, In Memoriam does veer, as Tennyson says, between extremes giving the reader a chance to really contemplate a whole spectrum of emotional logic. But it also offers more than that, as W.B. Yeats once noted it is abundant with “scientific and moral discursiveness” corresponding exactly with Tennyson’s age, which the poet captures masterfully. I was slowly making my way through In Memoriam when a friend bought me a copy of Tennyson: An Introduction and A Selection prefaced and chosen by Auden. Writing about his subject Auden is both praiseworthy and vituperative, fluctuating between the two without suspiring. His choice of Tennyson’s work is, however, very well considered and contains some of my favourite poems. At one point Auden suggests that “the feelings which his gift revealed to Tennyson were almost entirely those of lonely terror and desire for death.” He is indeed right as most of Tennyson’s verse revolves around those themes, for example in The Lady of Shallot, Tennyson says: “Heard a carol, mournful, holy/Chanted loudly, chanted lowly/Till her blood was frozen slowly/And her eyes were darkened wholly/Turn’d to tower’d Camelot/For ere she reach’d upon the tide/The first house by the water-side/Singing in her song she died/The Lady of Shalott.” In The Vision of Sin, he describes death as “King.” And although Tennyson most frequently refers to death in a grave and foreboding manner, he is also occasionally flippant. In the same poem speaking on the subject, he says: “Tell me tales of thy first love/April hopes, the fools of chance/Till the graves begin to move/And the dead begin to dance.” Death is omnipresent in most of Tennyson’s work, and one of my favourite poems in this vein is The Eagle, where Tennyson illustrates self-sacrifice with moving minimalism: “He clasps the crag with crooked hands/Close to the sun in lonely lands/Ringed with the azure world, he stands/The wrinkled sea beneath him crawls/He watches from his mountain walls/And like a thunderbolt he falls.” Tennyson had a vibrant imagination, a robust symbolic facility and a melodic grasp of metre. But he could also be somewhat slapdash due to his intense and lingering feelings of melancholia. Carlyle observed it best in his letter to Emerson, when he said that Tennyson was a “solitary and sad” man forever “dwelling in an element of gloom” and “carrying a bit of chaos about him”. In Memoriam offers a maudlin soberness replete with grief, love, beauty. The elegiac leitmotif is encapsulated lucidly if somewhat reticently in the following lines, when thinking of Hallam Tennyson says: “Dark house, by which once more I stand/Here in the long unlovely street/Doors, where my heart was used to beat/So quickly, waiting for a hand/A hand that can be clasp’d no more—/Behold me, for I cannot sleep/And like a guilty thing I creep/At earliest morning to the door/He is not here; but far away/The noise of life begins again/And ghastly thro’ the drizzling rain/On the bald street breaks the blank day.” One of Auden’s key grumbles about Tennyson’s poetry is the fact that “there was little about melancholia that he didn’t know; there was little else he did.” Thus Auden concludes that Tennyson’s single minded preoccupation is one of the reasons his poetry is “bad” to the point of obscurantism. But I daresay that range does not qualify the poet’s abilities. Auden of all people should have known that having had an immense range and a lot of dross to show for it. Perhaps mine is an overly simple view but I think that a poet’s puissance is measured by the emotion his work solicits from the reader since poetry is as Lawrence Durrell once said the “science of the heart’s affections” and going by that definition Tennyson is a master of that science who miraculously turned “twilight into flakes of fire” without burning the parchment. Hi great article. When you say: “Tennyson was often referred to as “the Poet of the People,” celebrated for reflecting the mind of an entire nation. This has more recently counted against him…” what exactly do you mean by it more recently counting against him? Just curious? Thanks.